PerfectUrine.com buys only direct from Spectrum Labs and carries the newest Quick Fix Formula 6.2! Quick Fix Synthetic Urine is, hands down, the best fake pee in the industry! Because it’s formulated with all the same ingredients your own urine has, it makes for the perfect substitute for your own whiz. But, because it doesn’t contain any toxins or harmful bacteria, it allows for a cleaner, safer, and healthier alternative to using your own pee. Trusted by millions of customers for over 25 years, Quick Fix has long been the industry standard for high-quality synthetic urine. 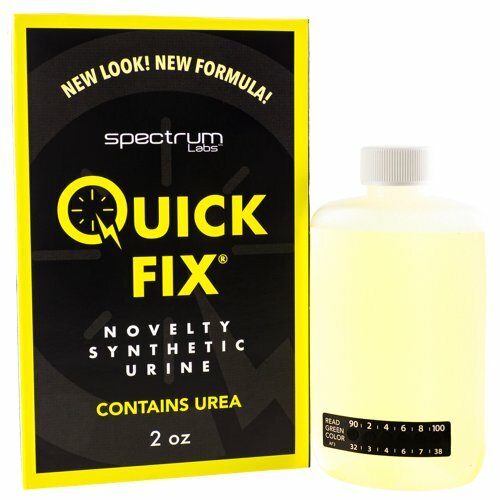 Quick Fix Urine comes as a premixed formula (version 6.2) in a 2oz bottle with a flip-top cap. The attached temperature strip ensures you deliver your synthetic urine sample perfectly at body temperature to create the most lifelike urine simulation; and the included heat pack will keep your urine warm for up to 6 hours when you strap it to the bottle with a rubber band. Quick Fix can be heated (and reheated) as many times as you need without it losing its lifelike properties. Plus, since it comes with a 2 year shelf life, it’s perfect to keep on hand for your last-second urine needs! Since Quick Fix is crafted in a lab and contains all the same chemical compounds as organic, human urine, it’s the perfect pee! Complete with urea, uric acid, creatinine, and many other ingredients you’d expect to find in real urine, this stuff is as close to the real thing as you can get! It has the same chemical properties and characteristics of the urine your body produces naturally so it even has the same pH balance and specific gravity. The only things missing are the harmful toxins and bacteria that are present in real pee. It’s the perfect alternative to your own piss if you’re into water sports because it eliminates the fear of transmitting dangerous diseases to your partner(s). Guaranteed to be toxin-free, Quick Fix is often used by urine testing laboratories as a control sample for experiments or for calibrating urinalysis equipment. That’s right - Quick Fix Synthetic Urine is so realistic, even lab equipment designed to analyze human urine can’t tell the difference between this lab pee and organic whiz! Whatever your urine needs are, Quick Fix is sure to be the perfect substitute for your own piss. Because many laboratories will purchase Quick Fix, Spectrum Labs has continued to update their formula to stay ahead of urine testing standards. Currently on version 6.2, this formula keeps impressing lab techs and urine fetishists alike. Since Quick Fix entered the market in the early 90s, it has been the best in the business. Grab yourself a bottle today, or spring for Quick Fix Plus to get an extra ounce of the highest-grade synthetic urine money can buy! The Quick Fix Synthetic Urine is an easy to use, pour and go solution that only takes 10 seconds to activate. Just place the contents in the microwave for about 10 seconds or until the temperature strip on the bottle reads between 94-100 degrees F. Shaking the bottle completely before usage will allow a more accurate reading to appear on the test. Once the Quick Fix Synthetic Urine reaches the desired temperature, place the hand warmer on the outside of the bottle. The sticky hand warmer will keep the bottle at a regulated temperature for about six hours. You can heat the Quick Fix Fake Pee with the hand warmer, however it will take up to an hour to heat the urine up completely. As soon as you are ready to take your test and the Quick Fix Synthetic Urine is correctly heated, just simply pop the top of the cap and pour the contents into the cup that is given to you. The Quick Fix Synthetic Urine is only intended for a one time use, we do not recommend to use this product on more than one drug test however this product can be heated as many times as you desire. Does the Quick Fix Synthetic Urine have an expiration date? Yes, the shelf life for the Quick Fix Synthetic Urine is two years. I heated my Quick Fix Synthetic Urine up for my test today but ended up not using it. Is it still good to use or do I need to buy another one? The Quick Fix Synthetic Urine can be reheated as many times as you need to. Heating it up over and over does not mess with any of the compounds; you will still be able to pass any drug test. I've been researching your product and heard that labs are now being able to test for synthetic urine. Is this true? Some labs were testing for a compound found in your urine called Urea and the Quick Fix had not yet contained any uric acid. With our newest 6.0 formula, the Quick Fix Synthetic Urine already has the uric acid pre-mixed into your sample, allowing there to be no possible failure. Are labs allowed to reject my urine if it is lacking in foam or smell? Legally no lab is allowed to refuse any sample of urine that does not have a distinct smell or one that does not contain foam. I heated my sample of your fake pee for too long and now the temperature strip is completely black, what does this mean? Basically this means that you've just overheated the urine and need to let your sample cool down. Simply just remove the cap from the bottle and let the urine begin to cool down for a couple of minutes. Once it begins to cool down, the colors on the temperature strip will begin to show through and you'll be able to tell the temperature of your bottle. My Quick Fix Synthetic urine has been in my car for the past 6 months and it's gotten over a 100 degrees F a couple of times. Do I need to purchase a new one or can I still use this sample? Quick Fix Synthetic Urine 2oz added to cart!